If you liked "My Number Books 11-20" which are listed in my TPT store, you will love these. 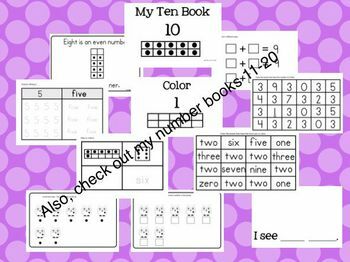 This is the first part with numbers 1-10. There are 11 pages in each book for a total of 110 pages all together. You can copy 2 books per page. My kids love these and it really helped them with their learning their teen numbers in the Spring. I have revamped some of the pages for numbers 1-10 and I think you will love it. This is a must have for all math classrooms!